When planning to hire a Virgin Islands sailing charter, there are many things you need to consider. First of all, there are various types of sailing vacations you can choose from and your vacation can be influenced by the way you approach your planning. For example, you will plan a honeymoon differently than you would plan a family getaway. What Do You Expect from Your Virgin Islands Sailing Charter? No matter if you are an experienced sailor or a beginner, you should first establish the type and size of boat you want for your vacation. So it would be better to see several boats online. This way, you will know exactly what to expect. More than that, heading on a day trip before the vacation is a good idea so that you know if you can cope with sea travel successfully. What Type of Sailing Vacation Do You Want? As mentioned before, the type of vacation you plan should be according to the event. Whether you want to spend your honeymoon or you just want to celebrate your daughter’s birthday, there are several options for you. 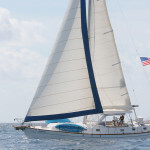 Go for a large sailing charter if you think about family getaway. On the other hand, if you need a romantic and intimate honeymoon, a smaller charter is the best option for you. The cost for each sailing charter is different and it depends on several factors, including the trip itself, the number of days, the number of people on the boat and the like. So before making any plan, inform yourself about the costs. You can check several rate plans online from different sailing charter companies. Once you pick up a company, send them an email or call them for any further details. What Do You Need To Pack for Your Sailing Vacation? The things you need to bring along with you for your sailing vacation depends on what you plan to do and who comes with you. If you want to stop in different ports in the Virgin Islands, take all the necessary outfits for sightseeing and shopping. On the other hand, if you just plan to sail, you should bring a bathing suit with you. What Are the Advantages of a Sailing Vacation? A sailing vacation can offer you more than a relaxing time. When sailing, you detach yourself from your daily routine and you become one with the turquoise water of the sea. The sky above will be your most beautiful roof during your vacation and the dolphins will offer you the most spectacular show. How can you see all that? When planning to visit the Virgin Islands, sailing charter operators can help you make your vacation special.